Last weekend, my mom brought up some binding for me to do, and since talking to her and others I realized everyone thought there was only *ONE* way to attach bias binding to a project. There’s not! 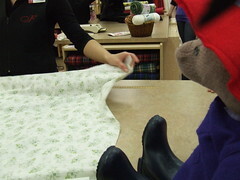 Today I’m going to walk you though step-by-step, and show you how to do it in one go through the sewing machine. I am lost in fabric. 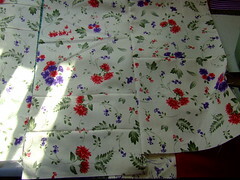 And today I got up from the computer, went to start supper, then sewed. And sewed. 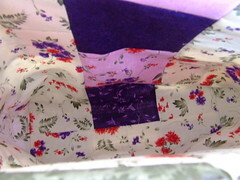 I sewed for two hours because I was inspired to make a tote bag from a charm pack and some scraps. (Also Ron figured out why the plugs out there weren’t working.) Mom brought me some scraps from her local shop that the lady there was throwing out. I KNOW!Ã‚Â I can’t bear to just toss out fabric – the amount of one print and a bit was enough to completely line my tote bag. All it took was some creative piecing. I am also jazzed that my library now emails me to tell me when my books are due. Library trip tomorrow, who’s with me? And to tie it in, I’ve made a couple of totes for the library to sell so they can raise money. I’m nice like that. 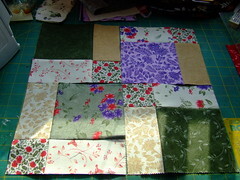 Using moda’s Natural Garden charm pack, I made two disappearing nine patch blocksÃ‚Â from this tutorial. I think the charm pack had 32 or 40 5″ squares, all different. 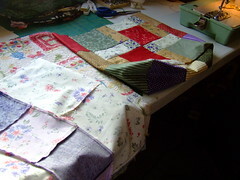 I arranged the patches in a pleasing manner first, saving the ones I didn’t like so much for the sides of my box tote. I had 4 blocks left over, which I eventually used on the inside. 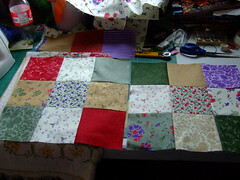 After I did the block, I sewed nine patches in a very long row for the sides and bottom of the bag. I had to carefully piece one long edge around three edges of one block, then the other edge to the other block. Then my outer bag was done. Since I need to work on my accuracy, I was extra careful to iron, pin and align seams. Iron every seam before it crosses another seam – this is the difference between something looking handmade and it looking hand crafted. I pieced all of the scraps I had from one coordinating print all together, continually holding them up to the blocks as I went to best take advantage and minimize waste. When I saw that I needed a bit more, as luck would have it 4 of the leftover charms fit right in. I put that strip right up the middle of one inside panel. Since the inside is pieced differently, I boxed the bottom by pinching the corners and sewing a triangle shape. Yesterday was Ron’s birthday, and with a small and understated celebration we pretty much went on with our day. Part of that included him getting up on the roof to try and fix a piece of loose steel. 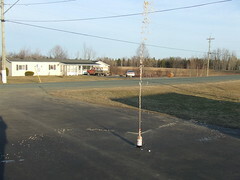 Of course it was windy as well. 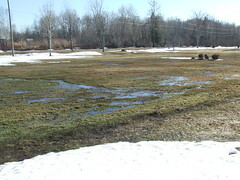 We were supposed to go out on a date to Tim Horton’s (we have a free coffee you know) and a trip to the local greenhouses, but the day grew later and nastier so we stayed in. I made him homemade baked fries and homemade chicken strips. They were really good. The kids gave him a couple puzzles and a movie, so he and Meaghan also started one of the puzzles. There’s always at least one in the works on the table, and they only ever get cleaned off when we can’t see the top anymore and they start a new one. Meaghan has also said it woudl be nice “for a change” to actually *eat* at the dining room table and it not be a special occasion. Hmmm, what else… Oh YES. Our neighbor behind us gave us fits AGAIN as the Public Health guy showed up on our doorstep once again. but this time he was rolling his eyes. He took one look around and then stated he was going to call them back and tell them not to call him about us any more. And to go really far back in our week (wow, I didn’t update last weekend? Huh.) over Easter Sarah went to visit Addison & Kaytlyn and when we took her down there, we did some shopping. We also took Paddington. In other Sarah news, while we were shopping for Ron presents, she noticed an almost new computer at the pawn shop. Dads took her back and I got a text from her later saying she bought it (of course). And do you know how geek children rebel? They buy a computer with VISTA on it. I am crushed. At least she’s installing FireFox on it, as we already had The talk about Safe Surfing. Sarah also took a video on her camera, no idea when we’ll get it uploaded. In the wee hours one morning, I thought of one of the things in my Mom Bag Of Tricks. 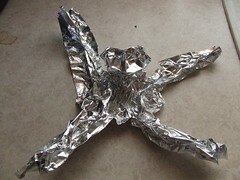 This little craft is cheap, easy and keeps kids of pretty much all ages occupied. Even snarly teens. It also works best if you don’t try it a lot. 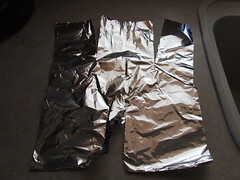 You’ll need some tinfoil, that’s pretty much it. 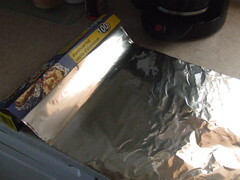 Pull off a sheet of tinfoil, any size. It doesn’t have to be square, just not too long. Make two tears down from the top, and one tear up from the bottom. You can cut it, but it’s not necessary. 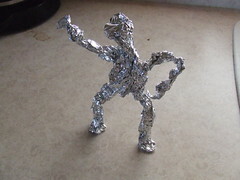 Squish the sections together a little to form limbs, and scrunch the top middle section loosely to form a head. Bend the limbs a bit to give it personality. You only have to show a child how to do this once, and it keeps them occupied for a few minutes as they make more and use their imagination, although it’s not really super-quiet. Especially with boys around. I got this idea out of an old craft book I had from Sunshine publishers – remember them? They did a whole array of seventies craft books. I loaned my Children’s Crafts book to a fellow Girl Guide leader about ten years ago and haven’t seen it since. I miss that book. I felt like warmed-over crap when I got up this morning, and since lollygagging over the internet with a pot of tea wasn’t helping, I got the brilliant idea to get on the elliptical for a change. Hadn’t been on it in a week. Moby – Alice: Moby is pretty good to space out to, and warm up to. Pink – Sober: I just like it. Yeah, that did the trick. I use my blog as my journal / diary / brain dumping ground, but I do have a plain simple notebook where I write down the day-to-day things. My note,s the tasks I need to do, the ones I’ve *done*, and everything else I can scribble. My grandmother did the same – in a real sort of journal-daybook fashion. Just brief notes, highlights, things to remember. We;ve kept them all. Blue wire coiled books, lined up along a shelf at one time, now in a box. I just moved a pile of mine from the storage room, laying on the floor, a haphazard mess spilling over, to the bookshelf in the hall. The set of shelves I got from my grandfather’s place. Do you keep your old journals? If you do, do you ever go back and look at them? Sometimes I do, when I find them. I like to see if my good ideas are still relevant or just embarrassing. There’s note sin there I forgot, notes in there on things I want to remember. Menu plans, a dozen different blog template ideas, sketches I forgot I scribbled, but remember that I did them to prove to myself I still could. I’ve never though about what will happen to them eventually. Maybe I should.